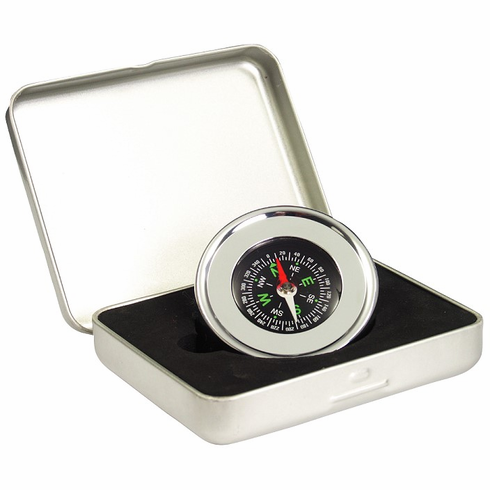 This attractive desk compass from K&R features a high-polished silver colored zinc body with a fluid filled capsule displaying 5 degree resolution. And the bottom surface of the compass is felt-lined for your desk's protection. The small size combined with the durable weight makes this unit an excellent paperweight -- and one of the most stylish paper weights you'll ever see. There is only a small amount of engraving surface on the 0.25 inch perimeter around the top of the compass, but it can be engraved by a skilled engraver. The aluminum gift box however, can not be engraved. Engraving services are not available through The Compass Store. Please see your local engraver for an assortment of engraving capabilities on zinc. Each Eclipse Desk Compass arrives in a foam lined hinged presentation box made of aluminum.